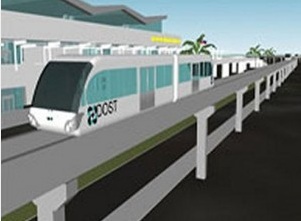 The Department of Science and Technology (DOST), which has acquired new-found influence under the Aquino administration, is set to lay on Monday the foundation for an ambitious monorail project that will run around the sprawling Diliman campus of the University of the Philippines (UP). DOST secretary Mario Montejo, a brother-in-law of Executive Secretary Paquito “Jojo” Ochoa, said in December 2010 that the monorail, called Automated Guideway Transit or AGT, was expected to be operational in June this year. It turned out that Montejo was referring to the groundbreaking ceremony, which he, along with UP president Alfredo Pascual and Quezon City mayor Herbert Bautista is expected to attend at the corner of Jacinto and Lakandula streets in UP Diliman. The event will also be sealed by the signing of a Memorandum of Agreement by Montejo, Pascual, DOST-Metals Industry Research and Development Center director Arthur Lucas Cruz, UP Diliman chancellor Caesar Saloma, DOST-Philippine Council for Industry, Energy, and Emerging Technology Research and Development director Amelia Guevara, and UP vice president for development Elvira Zamora. The AGT, developed by the DOST initially for UP Diliman, is a rail-based local mass transit similar to the MRT and LRT, except that it runs on a single rail which acts as its sole support and guideway. “We are coming up with a local AGT to address the severe lack of less expensive and environmentally sustainable technology alternatives,” said Montejo, who is an alumnus of the UP College of Engineering. DOST assistant secretary Robert Dizon, the designated project leader, said that President Noynoy Aquino wants the AGT project to be tested thoroughly. “The President wants quality to be translated to commuter safety and transport reliability,” he said. A group of engineers from UP Diliman are working with DOST on this project. The prototype will have two 60-passenger coaches to run on a 56-meter test track in the campus.